These Are Some Of The Best London Tourist Attractions! Looking for the best London tourist attractions? Well, you certainly will have a few to choose from! We’ve played tourist in London numerous times over the years by now – each time exploring a little bit more of the city. You might know that we both lived in the UK once upon a time. Funny enough, we are yet to see the city together – and we want to change that very soon! As for your trip to London, the city is packed with great attractions around every corner and for all interests. The nice thing about London is that there are loads of places to visit for free – and we will tell you which ones in this post. From classic museums, palaces, and monuments to the more unusual places to visit, you’ll get the chance to explore London and see the sights and attractions that interest your group! So, grab your London attraction map, this post, and off we go! Oh, and we will also briefly cover how you can get London attraction deals and make use of a London attraction pass – should it work for you! 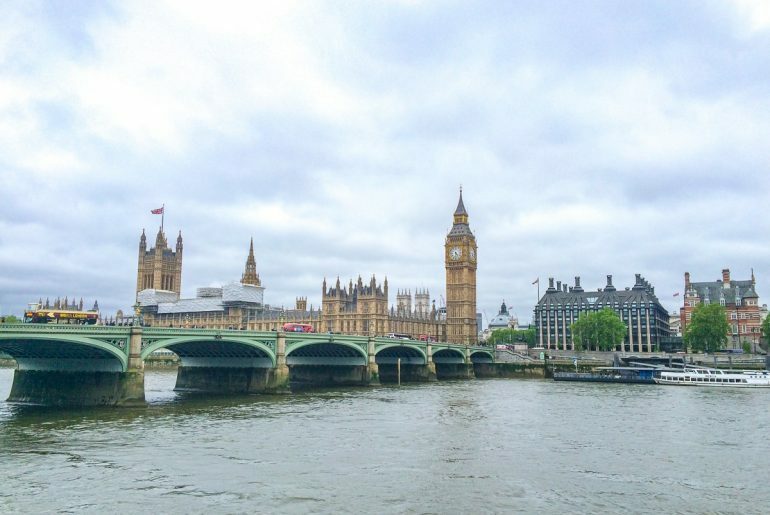 Westminster Bridge and the Palace of Parliament – a classic attraction! If you are planning a visit to check out London, then you should think about a few details before you visit this massive city. We figured it might be helpful to briefly talk about what you need to know before visiting: like general information, currency, weather, transportation, and more! London is a diverse metropolitan centre made up of over 8 million people. The city is the capital of England – and also the United Kingdom. It’s also one of the most visited cities in the world! The language spoken is English – but the city is pretty diverse (like Toronto) so don’t be surprised to hear multiple languages when you visit. London is divided into two halves by the Thames River – a winding river that snakes its way through the city centre. There is a north side of the river and a south bank – and each has different neighbourhoods, attractions, and things to check out! The currency used in London is the British Pound – so make sure you take some out before you leave or be prepared to take out cash when you land. You can use card basically everywhere in London but it’s always good to have cash on you. Also, the Pound is different from the Euro – so if you carry on through Europe, you will need another currency! Determining the best time to visit London is complicated – since the UK is known for cloudier weather. That said, spring might be a little wet but not as wet as the winter months. Summer has a good chance of being warm – but the city can get VERY busy. So, we suggest visiting in the fall since the weather is likely to still be nice and only a bit cooler. Whatever time of year you visit, there is always a chance for rain in the United Kingdom. So, – jokes aside – you can even enjoy London in the rain since there’s loads to do indoors and a good rain jacket is all you need to survive! 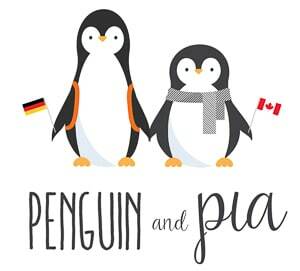 If you are heading to Europe, you should also check out our packing list for Europe! As for getting around London, you have options when it comes to one of the most famous transit systems in the world – made up of the buses, trams, subway (London Underground), light rail, river trains (ferries), and more. As a visitor, you should check out the official Transport for London site. As for riding and paying, you have a few options as a visitor. You can simply pay-as-you-go and/or buy single tickets to ride. Another option is to pay for transit fares using a contactless debit or credit card – which is super handy. The machines also take Apple and Google Pay. The tap cards used for the transit system are called Oyster Cards. You can get a Visitor Oyster Card, which is a pre-paid Oyster Card that also comes with discounts on restaurants, museums, and more. You may also just get a regular Oyster Card – which is the regular refillable tap card. The nice thing about these Oyster cards is that you can return them when you are done and get a deposit (5 pounds) back. Other cities – cough, Toronto – don’t allow for this. The subway is famously known as the London Underground – or the Tube – and you can ride it to many of the top attractions across the city. The Transport system also has Visitors Passes and Travel cards, which you can read about here. Consider a London walking tour if you want to get some exercise and you are able to. You can take a bike tour around London to get a feel for the city from the streets and feel the wind in your hair. Or even do a hop-on hop-off sightseeing cruise on the Thames to see the city from a different perspective! We’re not going to cover where to stay in London in detail since we have created a whole guide on where to stay in London. That said, there are SO many places to choose from in all different areas (close to different attractions). Staying in central London but in a quieter area is a good idea since you can access attractions by day, enjoy a night out, and then come back to sleep well before adventuring again. So, you can check here for accommodation in London. Specifically, check out The Sanctuary House Hotel for a beautiful hotel and Clink 78 for a great hostel. Both of these properties are centrally-located and easily connected to public transit to get around. In fact, Clink made our list of European hostels we loved staying at! Now that you have a few pieces of useful information about London, let’s dive into the top London attractions across the city. Of course, this is not everything – but we wanted to include the best known and a few different attractions for all different interests and budgets. Also, these are in no particular order so don’t feel like you have to go in order! Just so you know, we left out popular “areas” like Piccadilly Circus, Oxford Street, Covent Gardens, Trafalgar Square, Camden Market, Borough Market, etc. 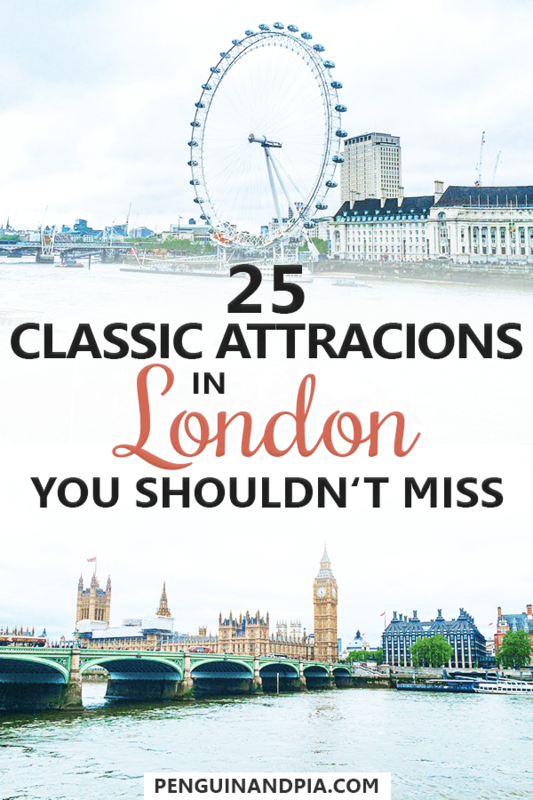 While these might be considered tourist “attractions” to some, we wanted more of the classic physical places/buildings/attractions you can visit in London. These popular areas will be included in another post. 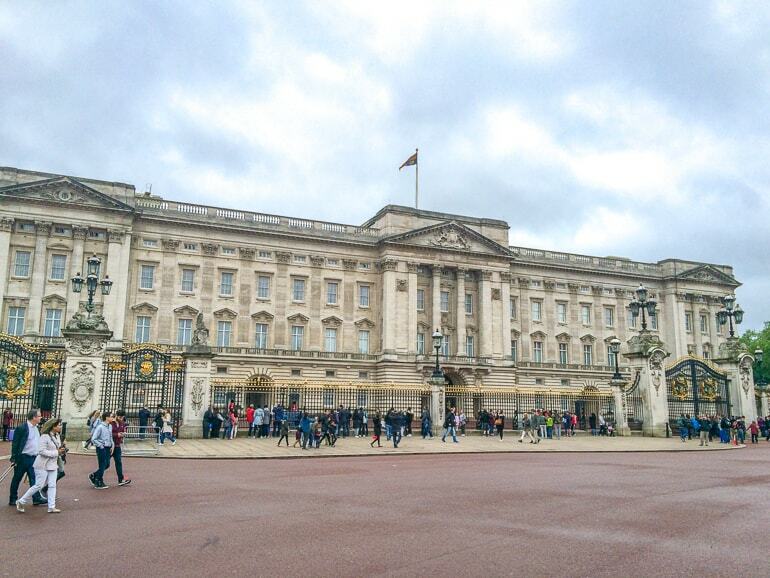 Buckingham Palace – with plenty of viewing space by the fence! Of course, we felt like we had to start off the list strong with Buckingham Palace. As the royal residence of Queen Elizabeth II, it’s a building that needs little introduction. Fun Fact: Buckingham Palace is one of the only fully-functioning palaces (that still carries out administrative business and serves as a royal residence) in the world. 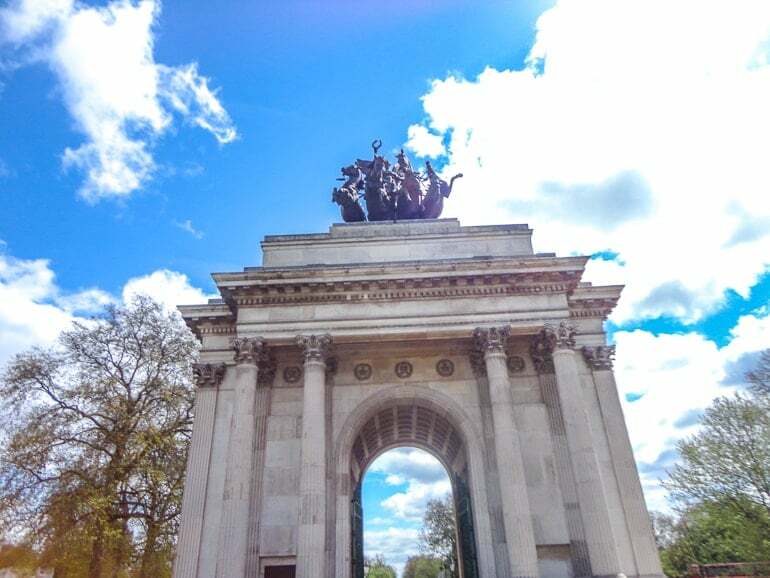 It’s located in Westminster – surrounded by lovely green spaces and connected to The Mall, a royal roadway leading to the heart of London. In the summer time, the Palace is open to tours. You can tour the Palace and the State Rooms and check out how lavishly decorated the Palace is. There are also pieces of art by famous painters like Rembrandt. You can get an audio guide in a bunch of different languages which is nice for visitors from afar! Another reason Buckingham Palace is a top attraction is because of the Changing of the Guard – a “show” that happens once a day at 11:00 am. However, the Changing of the Guard happens only on certain days of the week (from what we can tell Monday, Wednesday, Friday, and Sunday for March/April 2019). The ceremony lasts about 45 minutes – and if it’s raining it’s likely to be cancelled so it’s kind of hard to plan ahead for. 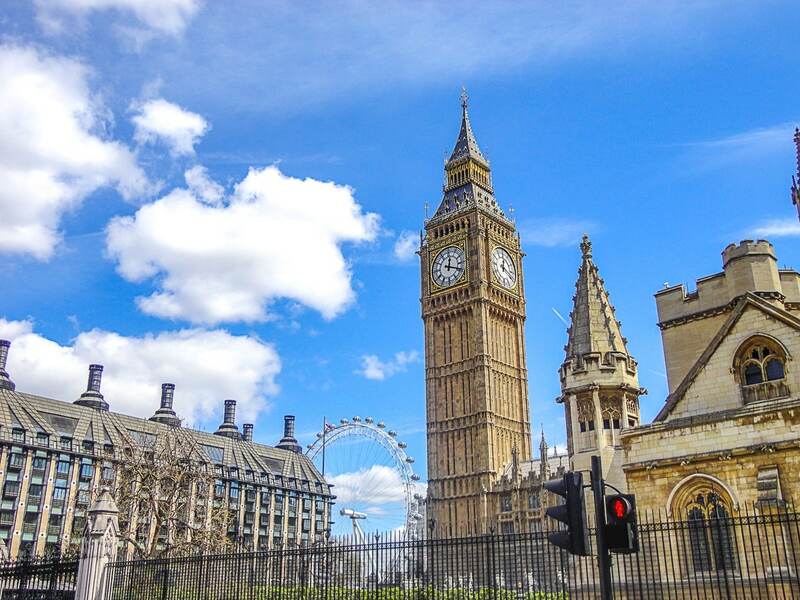 The Palace of Westminster and Elizabeth Tower – with Big Ben inside! Again, one of the most iconic/photographed buildings in the United Kingdom – and arguably the world – is the Palace of Westminster and the clock tower “Big Ben”. 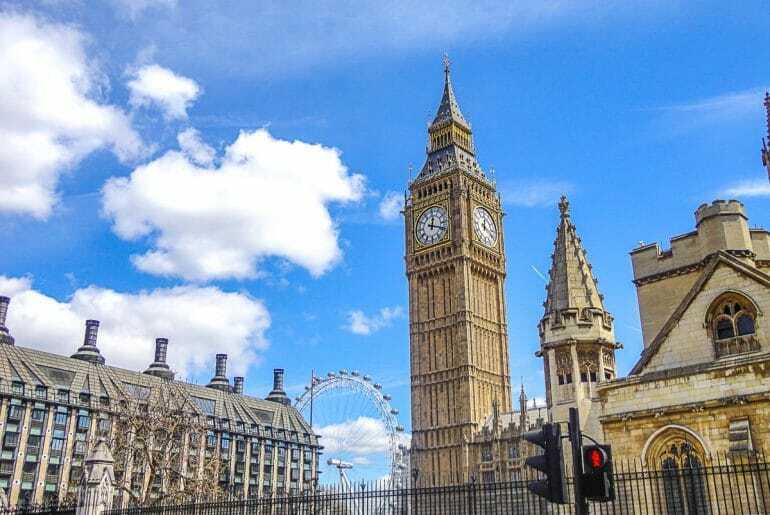 Before we go on, let’s set the record straight: Big Ben is the name of the largest of 5 bells inside the tower. The tower itself is called the Elizabeth Tower, and that is all connected to the Palace of Westminster. Got it? Great! The Palace, located right on the River Thames next to Westminster Bridge, is where the UK Parliament sits. You can learn more about tours at the official website of the Palace of Westminster. The London Eye right on the river – next to a whole bunch of other attractions! As for touristy things in London, few can beat a spin on the London Eye. This massive ferris wheel – opened in 2000 – stands at 135 metres tall. At one time, it was the world’s tallest ferris wheel – but sadly it’s been passed. Regardless of height, this iconic structure is always a draw for visitors to London. 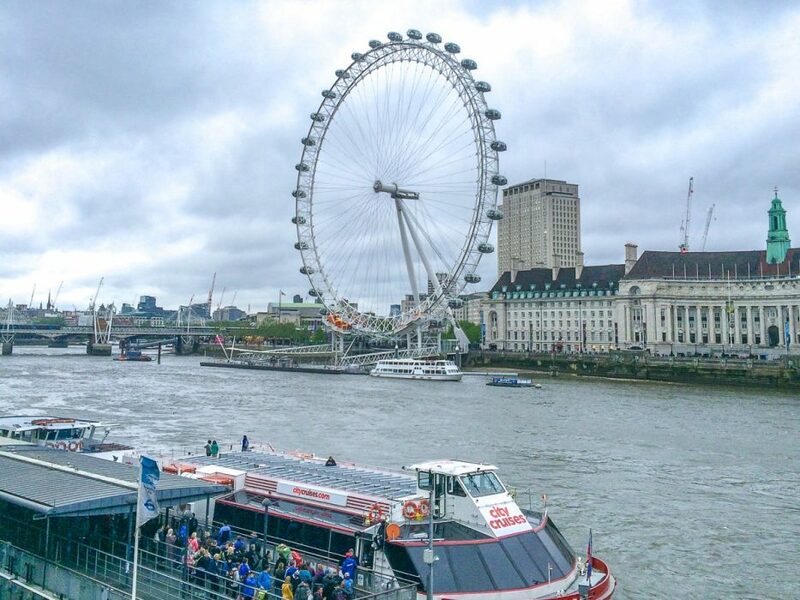 If you are heading to London and you know you want to ride the Eye (one rotation takes about 30 minutes), then you can look into London Eye line-skip tickets here. You can book in advance for a time slot and entry as opposed to just showing up. If you just show up you might get passed by people who have tickets already and might have to wait for a while. This is a shot Eric took – pretty good from up there! Eric has been on it and liked it – Lisa on the other hand isn’t sure if it’s worth the money (but she’s also never been). Regardless of if you go or not, the Eye is located close to Westminster and other top attractions which makes it a good stop along the South Bank even if just for a photograph. Tower Bridge is certainly a popular sight! Built in 1886 and finished in 1894, the Tower Bridge that crosses the River Thames is arguably one of the most iconic bridges in the world. Now, it’s funny because Tower Bridge is often confused to be “London Bridge” from the famous childhood song. That bridge is actually just a few hundred metres away – and admittedly not as grand nor exciting as Tower Bridge! 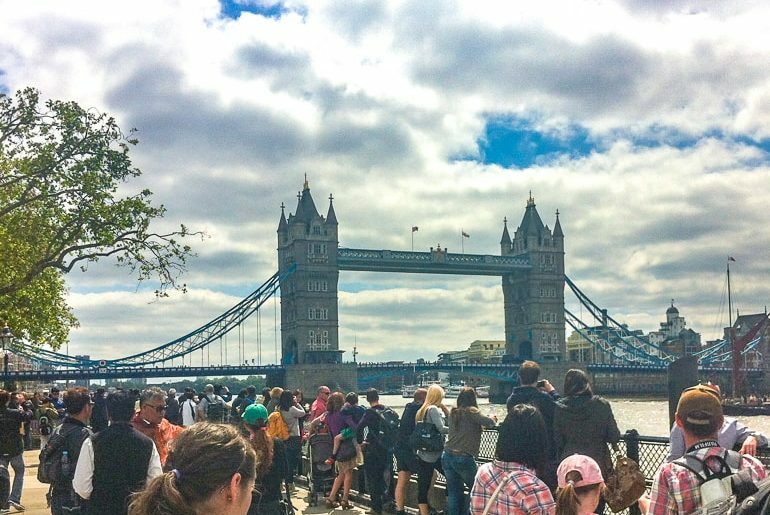 These days, you can walk across the bridge at street level (which is cool enough) but you should look into the Tower Bridge museum and tour, to check out the exhibits, the museum, and even walk across the top! There’s a glass floor where you can see the cars below as you walk across – it’s pretty cool. Eric visited the inside of the bridge exhibit years ago and loved it! 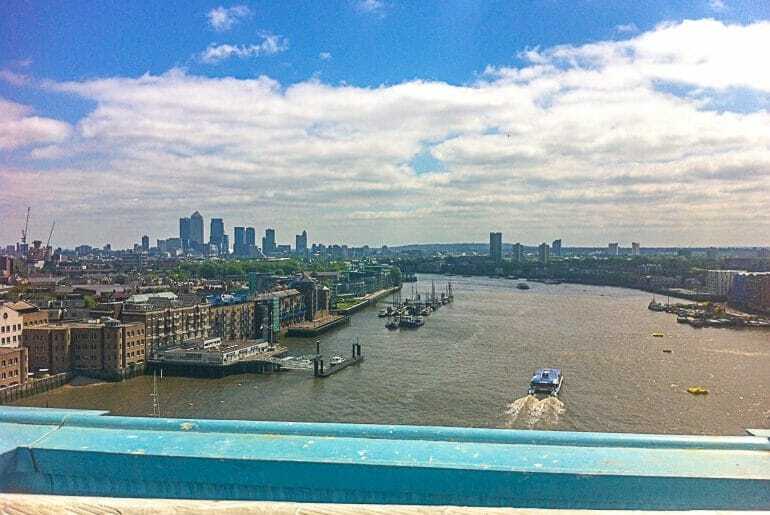 Just some views from the Tower Bridge – looking out towards Canary Wharf. While you are there, you can even visit the engine room which helps you appreciate the scale of the mechanisms at work behind raising and lowering the middle section. There was videos about the construction, life in London back in the day, and much more. Overall, the Tower Bridge was fascinating to see and experience. The museum was really interesting and you can learn a lot! We would definitely recommend a visit to Tower Bridge. The Abbey itself is beautiful and centrally-located for easy access. 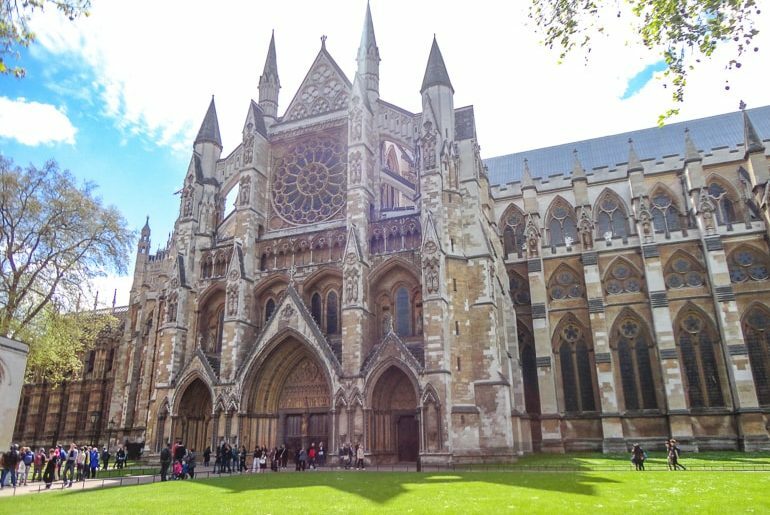 Located in Westminster, close to many of the other important buildings (like Big Ben), you’ll find the iconic church known as Westminster Abbey. The first church was founded over 1000 years ago – and since William the Conqueror in 1066, all English and British monarchs have had their coronation there! The current abbey was built in 1245, has been rebuilt and restored a bunch of times, and is now considered one of the most important Gothic structures in the whole of the UK. As such, the Abbey is now a UNESCO World Heritage Site. It’s also been the site to 16 royal weddings (yes, William and Kate, too) – and over 3,000 important British people (heads of state, poets, etc) are buried there. It’s a popular site to check out in London so if you want to visit, plan ahead. You can check the official website – or purchase an entrance ticket beforehand to avoid lines at Westminster Abbey. The Shard towering towards the sky with the Southwark Cathedral in front. If you are already in London, you may have seen a very tall glass structure seeming to pierce the sky? 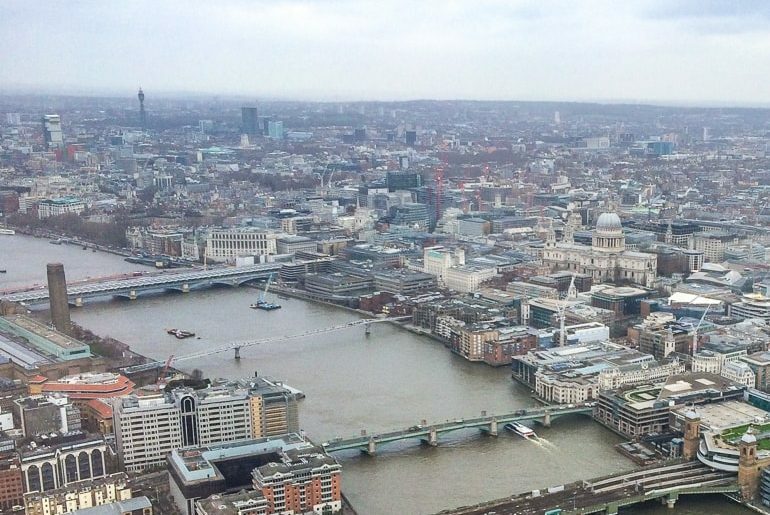 That’s The Shard – and you should definitely go up it! Built back in 2010 (so, fairly recent), the Shard has the highest observation deck in London on the 72nd floor. The building is also home to a few restaurants, bars/cafes, and even a hotel – the Shangri-La! Imagine waking up to views like that! 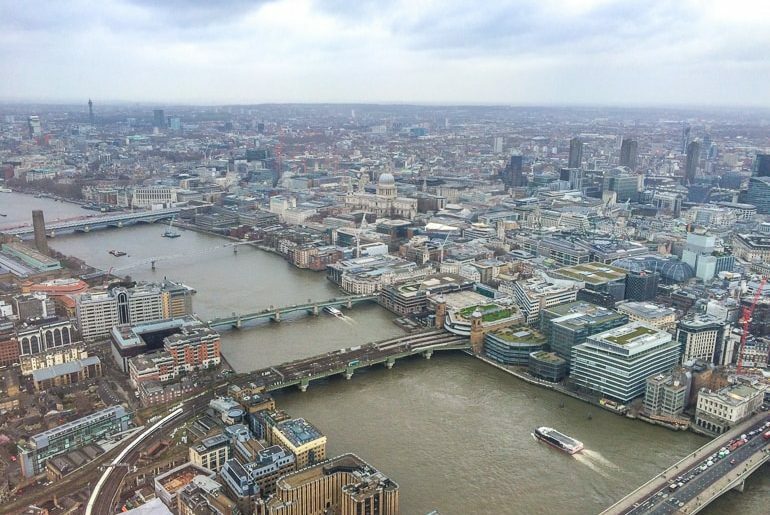 Just some of the views from the Shard – even on a gloomy day London is cool to see! Eric has been up there and honestly he loved it. He also loves high places where you can get a really great view, so the Shard fit the bill pretty easily. The Shard actually has different events and packages like Champagne at sunset or even yoga. They even have a weather guarantee where if you have bad weather you can come back for free! If you know you want to go, we’d suggest to book ahead to reserve your elevator/viewing time for The View from the Shard. This way, you can ensure you get the time slot you want – with the sunset hours being a popular choice! Don’t worry – once you are up there you can stay as long as you like. As far a royal palaces go, Kensington Palace just had to make the list. It serves as the official royal residence for a few important royals (including the Duke and Duchess of Cambridge – aka Will and Kate and the Duke and Duchess of Sussex – aka Harry and Meghan). Located in Kensington Gardens – the green space JUST west of Hyde Park – it’s pretty central and easy to get to if you are already in central London. The grounds themselves have seen massive overhaul and restoration works over the decades and are now open to visitors. If you want to check out Kensington Palace, you can visit the official website or just get an entrance ticket to self-tour the Palace to see the exhibits. The line to get in to see the Crown Jewels exhibit – it was long but, in our opinion, worth it! London has no shortage of historical buildings – so why not visit a 900 year old castle? The Tower of London is just that! Located very close to where Tower Bridge connects to the north side of the Thames, this famous fortress has a lot to offer visitors. Over the years, it has served as a royal residence, military barracks, an armoury, a notorious prison, and now a museum. 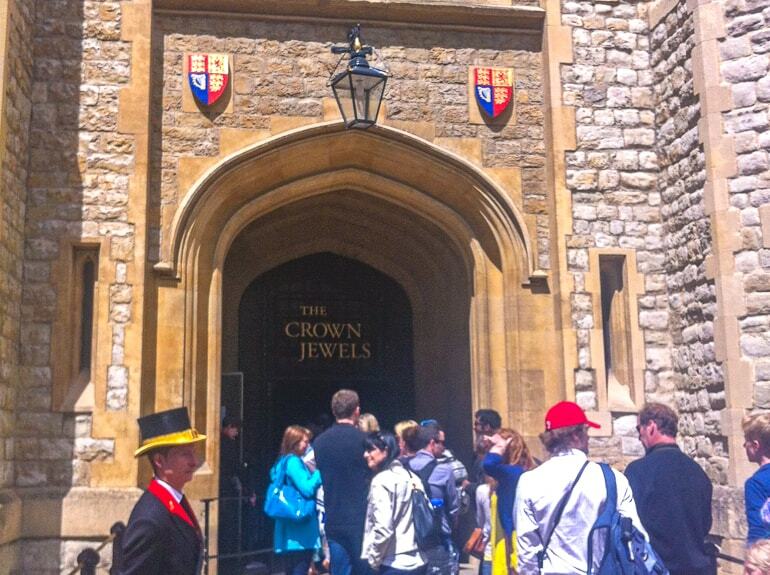 Oh, and can’t forget the fortified home of the “Crown Jewels”! Eric visited the Tower of London a few years back – and it was pretty cool. The exhibits were great but there were quite a few people given how popular of an attraction it is. Seeing and learning about the Crown Jewels was fascinating. You can learn more about visiting at the official website or just book a skip the line ticket to the Tower of London if you know your travel dates! If taking to the skies is your thing but you also want to experience some green space, you can have the best of both worlds at the Sky Garden. Located on the 35th floor of “The Walkie Talkie” building (officially 20 Fenchurch is the name and address), this “urban jungle” is a very cool space with restaurants, bars/cafes, and even events. As a visitor just having a look, it’s free to go up – but you have to reserve a time slot online. They do accept walk-ups but only during certain times of the day and those with a reserved visit time get priority. Online, there are lots of slots and spaces, but the popular ones are booked up weeks in advance so account for that. If you want to eat or drink, then that’s a separate reservation for the bars or restaurants up there. You can learn more about the Sky Garden at the official website. Given the views of the famous London buildings around you, it’s a popular place to watch the sunset, too! Are art galleries more your thing? Then the National Gallery in the heart of London is for you! The National Gallery is located right on Trafalgar Square – which is a place you can/should also check out but it’s not listed as an attraction on this list. The Gallery was founded back in 1824 and focuses on European art. In fact, the collection boasts over 2,000 paintings from as far back as the 13th century! The nice thing about most museums (the publicly funded ones) in London is that general admission to visit them is free. This makes experiencing these awesome collections accessible which is nice if you are on a budget. The same rule goes for the National Gallery – although special/rotating exhibits usually cost money to see. Check the official website for opening hours to plan your visit. Want to visit one of the most famous religious sites in the country? The iconic dome of St. Paul’s Cathedral never disappoints! St. Paul’s is easy to find. It’s located just north of the Thames, with the Millennium Bridge connecting the sidewalk in from the building directly across the river to the front of the Tate Modern Museum. You can see that in the photo above! 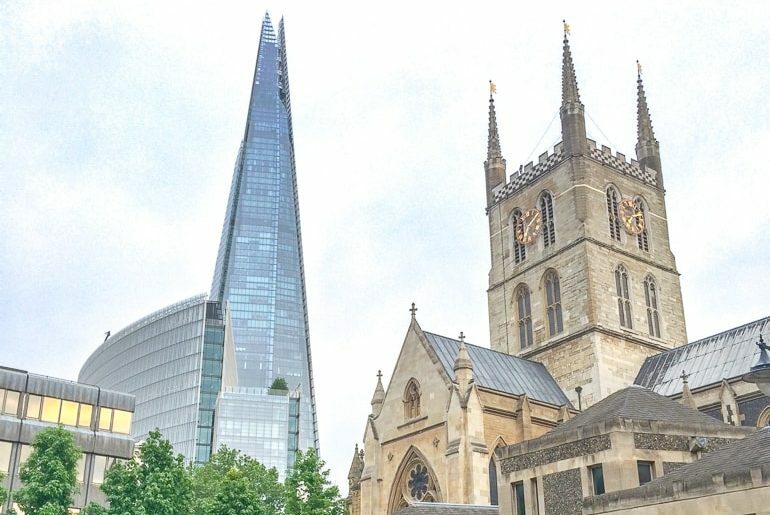 The original church onsite was from 604 and built on this point at Ludgate Hill – the highest point in the City of London. The old cathedral was originally build in 1256 but burnt down in the Great Fire of London. The new building (the current one) was rebuilt in 1675. The iconic dome stood as the highest point on the skyline for over 3 centuries until the 1960s and is still today one of the highest domes in the world! If you want to visit the cathedral, a skip the line ticket at St. Paul’s Cathedral might be worth your time considering it’s a top attraction. Also keep in mind the that the cathedral is a fully-operational parish with daily services and visiting hours separate. To learn about the visiting times, you can check out the official website. If you are into international and contemporary art, the Tate Modern is for you. The Tate is one of two Tate Museums in the city – the other one being the Tate Britain near Westminster on the other side of the river. We will talk about it right below this one! 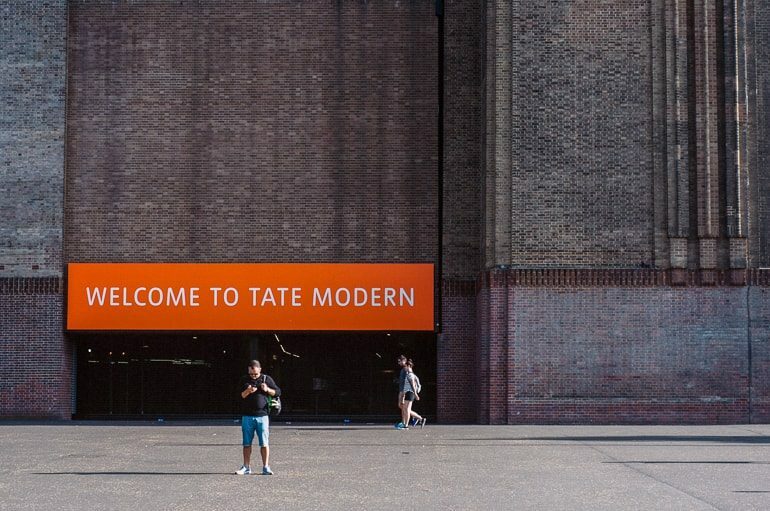 In any case, the Tate Modern was recently (early 2019) named the most visited attraction in the UK – passing the British Museum (also on this list). It’s probably a good idea to check it out. Of course, admission to the museum is free but special exhibits might have a small cost attached. The Tate Modern is easy to find – just look for the massive red brick tower/building exterior on the South Bank of the Thames. Still lost? The entrance is right across the river from St. Paul’s Cathedral – and connecting the two is the “Harry Potter” bridge. That’s what the Millennium bridge is somethimes called because it’s the one destroyed in one of the later Harry Potter films! As for the other Tate Museum in the city, the Tate Britain has a slightly different feel to it. Focusing more on displaying British art – including paintings, sculptures, and more – the Tate Britain also features a stunning staircase which is worth the photo. Located on the north side of the Thames, it’s just south of the Palace of Westminster on the river bank – close to the Vauxhall Bridge and Pimlico Tube Station. As with the other museums, admission is also free – but you pay to enter special exhibits. You can learn more about the Tate Britain at the official website. Want some great views of the city and a bit of exercise? Check out the Monument to the Great Fire of London. Located on the north bank of the River close to the base of London Bridge, this 62 m tall tower was built in 1671 to commemorate the Great Fire of London in 1666. In case you didn’t hear, that fire destroyed 1/3 of the city – including over 13,000 homes. These days, London is much more fire-proof since not everything is timber frames! The Monument itself has significance. It was placed near Pudding Lane – the street with the bakery in which the fire first broke out. Climbing the spiral staircase inside involves 311 steps – but you get neat views of the city from this vantage point just north of the river. You can learn all about climbing the Monument (including fees, wait times, and opening hours) here. Did you come to London to have a look at over 80 million specimens available in one museum? Oh, perfect – because that’s how many the Natural History Museum has! Okay, not ALL of them are on display at once – that would take up wayyy too much space. Located in South Kensington (close to the southwest end of Hyde Park), the Natural History Museum is one of three major museums on the famous “Exhibition Road” (the other two being on this list: Victoria and Albert Museum and the Science Museum). The museum is significant for its contributions to life and earth science – with some specimens even having been collected by Charles Darwin himself! The entrance lobby is iconic for the fact that there used to be a dinosaur – a plaster cast of the Diplodocus “Dippy” – and has now been replaced with a full skeleton of a blue whale (which is also quite a sight). As with most publicly funded museums in London, general admission is free with special exhibits costing a bit of money. You can learn more about the Natural History Museum at the official website here. Shakespeare’s Globe (the beautiful replica) on the south river bank from the outside. Are you a fan of Shakespeare? 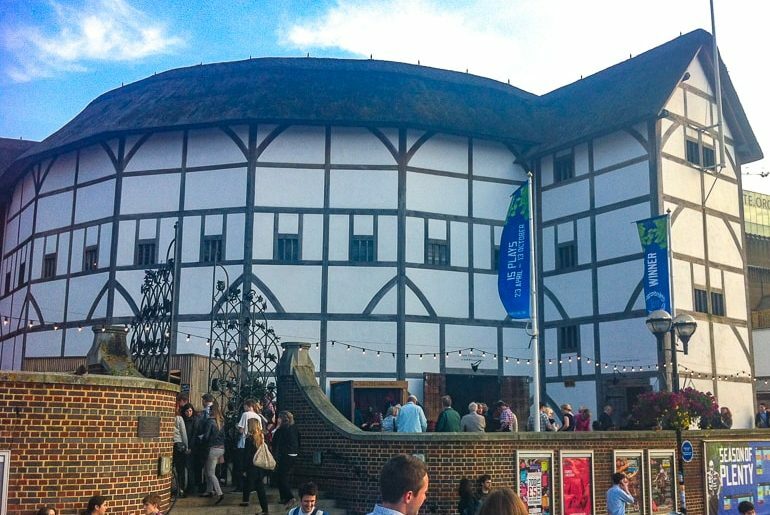 How about the history behind his famous “Globe Theatre”? Well, there’s a replica in London on the South Bank (very close to the Tate Modern) – and you watch Shakespeare done right just like it was experienced centuries ago! Eric has been to the Globe and had a true Globe experience of standing on the ground (called floor seats) and drinking an ale that they sell which is apparently similar to what was available at the time. The overall experience of the performance was just awesome – and he saw A Midsummer Night’s Dream. The best part is that, while there is balcony seating around the stage, floor tickets are only 5 pounds – but they sell out fast and in advance! You can check for tickets at the Globe Theatre website. If you want a more immersive experience, you can do a guided tour of Shakespeare’s Globe. If you are a die-hard Harry Potter fan, then London is a good destination for you to check out! Aside from the alleyway used as Diagon Alley, the Platform 9 and 3/4 in King’s Cross Station, or the fact that the Millennium Bridge was taken down by Death Eaters in one of the films, there is one other place where Potter fans can get their fill – Warner Brothers Studios in London! In what has become a major tourist draw, the studios have opened their doors to movie sets like Diagon Alley, the Great Hall, and more. You can tour the sets, see costumes and iconic props used in the films, and more. Now, the studios themselves are located outside the city centre in Leavesden. This is only attraction located outside the city – but we wanted to include it since it is just so popular that people might be looking for it! If you want to visit, definitely book ahead since it is super popular! Here is the official website for the Warner Brothers Studio – and you can visit the studio and take a guided Harry Potter Tour! If you want to check out the world’s largest museum dedicated to decorative arts and sculptures, then the Victoria and Albert Museum is for you. Sometimes called the V&A, the museum is located in South Kensington and is one of the three major museums on “Exhibition Road” (along with the Natural History Museum and Science Museum). Admission to the V&A is also free! The collection at the V&A has over 2 million objects in it – but since it’s been collecting since 1852, this makes sense. Inside, you can find works from all over the world spanning 5,000 years of “creatives” – art, print, textiles, patterned objects, furniture, photos, and more! In fact, the museum has the largest collection of objects from the Italian Renaissance era located outside of Italy. You can learn more about the Victoria and Albert Museum here. Of course, you can’t write a post on tourist attractions in London without mentioning the London Dungeons. This attractions is located near Westminster Bridge basically right beside the London Eye. If you want to learn about London’s dark past in a more “theatrical” way, then the Dungeons are for you. This creepy attraction gets many visitors each year eager to learn a bit of history while being taken on a fun journey by live actors, effects, and rides. We’ve never done it but apparently the one in London is quite good. You can find these Dungeon attractions in other larger cities – like Edinburgh – so if you miss it in London you might get a visit elsewhere! If you dare, you can find your entrance tickets for the London Dungeon here. As one of the largest museums on the planet dedicated to “human history”, the British Museum is a pretty important place to check out. The British Museum was founded in 1753 and has since grown and expanded into the mammoth building it is today. In fact, the Natural History Museum (listed above) is actually technically a branch of the British Museum’s collection. Today, the British Museum has over 8 million pieces in it – with only 1% of items on display currently. There’s actually a few controversial objects – like the Rosetta Stone – on display in museum. This popular attraction was the most visited in the UK – until the Tate Modern beat it in 2019. However, it’s still a great place to check out since it’s centrally located close to Russell Square. Admission to the British Museum is free – but you can pay extra for special exhibits going on at the time you visit. You can check them out here. Donations are always welcomed if you visit, though! If you want a more guided experience to get the most out of your visit, you can visit the museum and take a guided tour of the famous museum. If you want to experience some tranquility while you are wandering the busy city, head for one of the green spaces – there are loads. Close to Kensington Palace and Buckingham Palace are four “Royal Parks” connected together. The largest one is Hyde Park (there are actually 8 Royal Parks total all over the city). The park is full of smaller monuments (like the Wellington Arch), cafes, gardens and pathways leading in all directions. You might want to check out Speakers’ Corner – an area that members of the public use to protest, speak, and debate since the 1800s. You can even swim in The Serpentine – a small lake in the middle! Eric has walked through numerous times – but never swam! If you want to learn about opening hours and more, check out the official website for Hyde Park. Some would put this on the list of top attractions in London – and other would leave it off. Whatever camp you sit in, a list of top attractions in London just doesn’t feel complete without Harrods Department Store. Founded in 1849 and located in the lively area of Knightsbridge, Harrods is arguably one of the most famous department stores in the world. With a Latin motto that translates to for “all things for all people, everywhere”, it’s a hectic place famous for high-end items, its Christmas displays, food halls, and more. Fun Fact: Harrods had one of the world’s first escalators in 1898. It was actually a sewn leather walkway that moved people – and people at the time were NOT keen to ride it. The store (and this is true) offered customers brandy at the top of the escalator to help calm their nerves. Personally, we don’t know what all the hype is about but we know friends who have made a trip to Harrods like a pilgrimage while in London. We guess being the largest department store in Europe is pretty neat. To each their own! If you want to visit Harrods, you can check here for more information. If science if your thing, then why not visit the Science Museum? Founded back in 1857, the Science Museum in London is the final of the three major museums we keep talking about on “Exhibition Road” (the other two being the Victoria and Albert Museum and the Natural History Museum). They are all located in South Kensington. Inside the museum, the collection houses over 300,000 items from all facets of science – from astronomy to steam-powered engines. Because of the interactive exhibits, the Science Museum is a great place to bring kids while visiting London. They also added an IMAX cinema with rotating films on display. Not to sound like a broken record in this post, but admission to the Science Museum is free – but donations are always welcomed. If you want to plan a visit, you can check out the official website for the Science Museum! 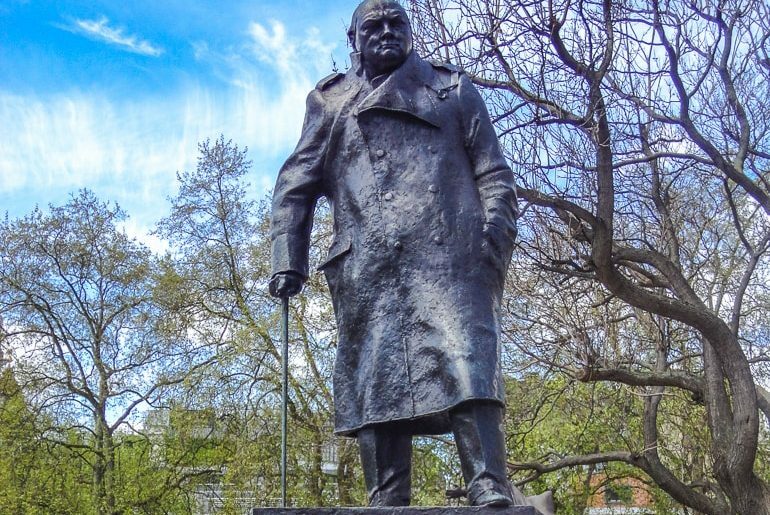 The statue of Churchill in Parliament Square – close to the War Rooms. London has a long and important place in European history – and so it should come as no surprise that wartime history is very popular in London. The city was bombed in 1940 and 1941 by the Germans in what is known as the Blitz – a series of air bombing raids. Many people and important objects were moved to bunkers around the city (or outside the city completely). One of these people was the Prime Minister of the time – Winston Churchill. So, if you want to know what his bunker looked like (with the ability to carry on running the country and the war effort) then head to Churchill’s Bunker/War Rooms! 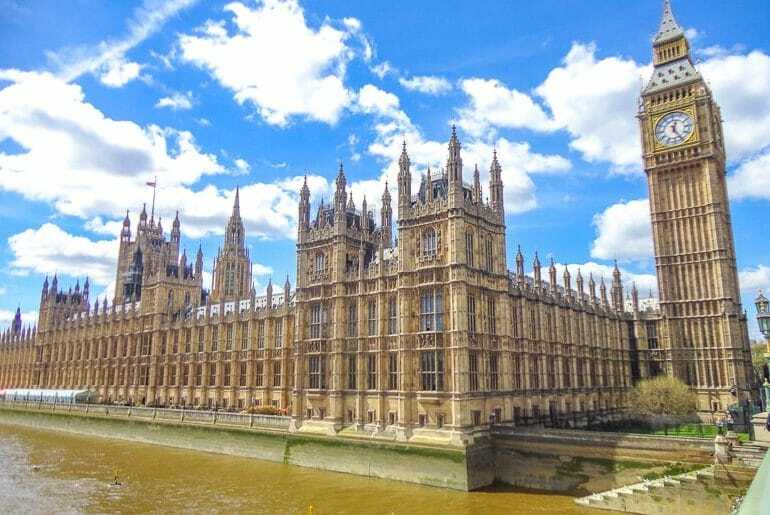 Located very close to the Palace of Westminster, the War Rooms are a very popular attractions in the city since they have been preserved for future generations with meticulous detail. If you want to learn more about wartime in London and visit the War Rooms, you can do both on a guided walking tour of Westminster and the famous War Rooms! Finally, are you so entranced by the the city of London that you want to know even more? Well, then you should head to the Museum of London! Located just north of St. Paul’s Cathedral and founded in 1968, this museum walks visitors thorough a timeline of London – from prehistoric times to today. The museum has permanent galleries which chronically show the city as it grew and expanded, was leveled by fire and plague, then through war and innovation. Eric really liked London and finds history fascinating so we actually really want to check it out when we go back. The Museum of London is free to enter daily – but of course there are paid exhibits that you can learn more about here. And there you have it – a very comprehensive list of the top tourist attractions in London! Now, this isn’t everything – but to write a post like that would be LONG. In any case, these are some of our favourite attractions – and a few that we haven’t yet been to but have had on our list for ages! 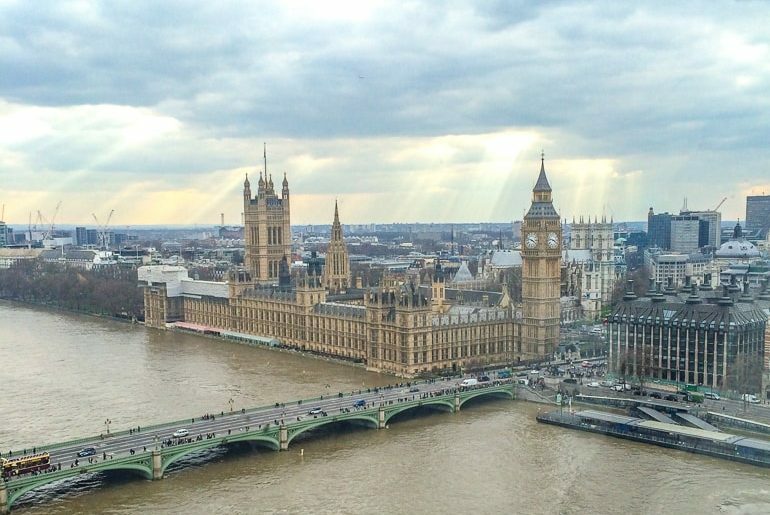 London is a massive city with tons to see and do – so let us know what you get up to. Have fun!